The Transformative Learning Area, ECpE’s modernized and updated space within the old Coover High Bay Area, opened with a ribbon-cutting ceremony last December. David C. Jiles, Palmer Endowed Department Chair and Anson Marston Distinguished Professor, Mufit Akinc, Interim Dean of the College of Engineering, and senior CprE major Brittany Oswald, delivered remarks. The space was designed with functionality in mind. In addition to banks of PCs and Macs, the TLA contains state-of-the-art lab equipment and large meeting areas. The idea was to create a collaborative learning space where students could work together and learn from each other. 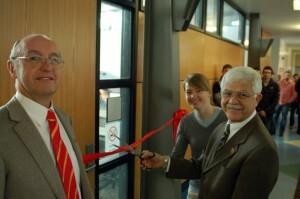 In addition, the space was designed to adapt to future changes in curriculum and trends in electrical and computer engineering, echoing the purpose of the original area. Originally built to house power systems equipment, the Coover High Bay Area has seen many changes over the last 60 years. Prior to becoming the state-of-the-art TLA last December, the space was known as the Active Learning Complex from 1999-2012. A $2 million grant from the National Science Foundation (NSF) created a unique collaborative instructional model for course design that transforms students’ education and develop the next generation of engineers. This project, Reinventing the Instructional and Departmental Enterprise (RIDE), transforms the electrical and computer engineering department and the way it trains a new type of workforce. The changes are driven by RIDE’s cross-functional, collaborative instructional model for course design and will lead to different department structures and a more agile environment able to respond quickly to industry and social needs — and ultimately serve as a model for electrical and computer engineering departments across the country. Another impact of the RIDE project will be broadening the participation of underrepresented students, especially undergraduate women, in the field of electrical and computer engineering. Project activities will emphasize inclusive teaching practices and learning experiences. NSF, based in Virginia, is an independent federal agency that supports fundamental research and education across all fields of science and engineering. In 2016, NSF made seven awards across the country to support revolutionizing engineering departments, an NSF activity known as “RED.” The RED goal is to help universities transform department structures, policies, practices and curricula to enable groundbreaking changes in undergraduate engineering education. The $2 million award to Iowa State is one of two given to an electrical and computer engineering department. Learn more about RIDE on the project’s website. A $4 million grant from NSF created Iowa State’s Scholarships in Science, Technology, Engineering and Math (S-STEM) initiative, called Electrical, Computer and Software Engineers as Leaders (ECSEL). 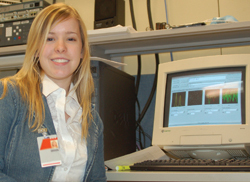 ECSEL is a partnership between ISU’s Department of Electrical and Computer Engineering, Program for Women in Science and Engineering, Des Moines Area Community College (DMACC) and Kirkwood Community College. The initiative will fund 272 scholarships over the next five years for students majoring (or preparing to transfer) in electrical, computer and software engineering at ISU, DMACC and Kirkwood, as well as implement a student experience model to help participants thrive and succeed in their degree programs. In the spring of 2017, the first cohort of students benefited from the S-STEM program. Learn more about ECSEL on the program’s website.